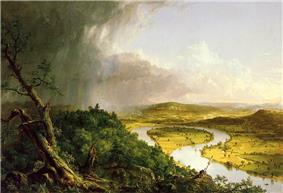 The painting moves from a dark wilderness with shattered tree trunks on rugged cliffs in the foreground covered with violent rain clouds on the left to a light-filled and peaceful, cultivated landscape on the right, which borders the tranquility of the bending Connecticut River. In returning to painting landscapes, Cole was faced with the dichotomy of the untamed wilderness and land cultivated by man. While other painters of the Hudson River School would merge the two peacefully, Cole did not shy away from portraying the two as opposites and showing how the cultivation would destroy the natural wilderness, and as a result never meet in the painting. On the hill in the far background, logging scars in the forest can be observed, which appear to form Hebrew letters. This was first noticed by Matthew Baigell long after the landscape was painted. If viewed upside down, as if from God's perspective, the word shaddai is formed, "The Almighty." Cole gives himself a tiny self-portrait sitting on the rocks in the foreground with his easel. Cole sold the painting at the exhibition to Charles Nicoll Talbot (1802–1874), merchant in the China trade. In 1838 he lent it to the Dunlap Benefit Exhibition, and later to the third annual exhibition of the Artists' Fund Society, which was held in New York in 1862. With his death in 1874, the painting was acquired from his estate by Margaret Olivia Slocum Sage, wife of Russell Sage. Olivia Sage was a known philanthropist, and her transfer of The Oxbow to the Metropolitan Museum of Art in 1908 would seem rather natural. However, she may have been inspired by a similar gesture in 1904 by Samuel P. Avery, Jr., who donated The Titan's Goblet, another of Cole's well-known paintings, to the Metropolitan Museum of Art. Furthermore, Olivia Sage's attorney, Robert de Forest, was a secretary on the Board of Trustees of the Metropolitan Museum. The painting today resides in The Metropolitan Museum of Art. ^ Miller, Angela (1993). The Empire of the Eye. Ithaca: Cornell University Press. p. 40.